I have started thinking about making my own prayer wheel. It would be made from a newly baught can that is usually used for paint. However, being a stupid humanities student I cannot wrap my head around the problem how to make it spin. Does anyone know how big hand held prayer wheels are spinning or does anyone have any idea how to make it spin? The can would probably be one that can hold 0.1l and is 55mm tall and the width is 56mm. If possible, sew your mantra roll into a yellow silk covering to protect it. Be sure that the mantra roll is facing upward when you put it into the can. You don't want your mantra spinning the wrong way (unless you're a Bonpo ). Usually the mantras face out and the roll is rolled to the right, just like the prayer wheel when in use. There are also some other fine points about mantras at the top and bottom of your mantra roll, but first tell me if you can visualize my directions. Sorry I don't have any pics of the prayer wheels I have made. But I've definitely used the new small paint can method. 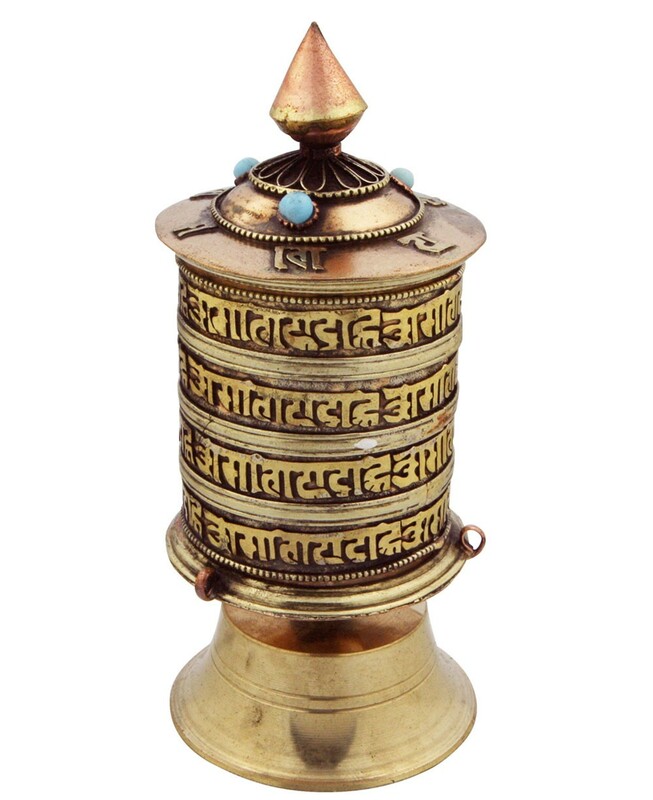 Is there any special mantra or ceremony to consecrate a home-made prayer wheel? Specifically that non-Vajrayana practitioners can do? AFAIK there is a small mandala to be put inside and you can put even amida mantra in. FPMT has pics of mantrasto fill prayer wheels and of the mandalas too. Maybe even sth about consecration. It is always a good idea to let a vajrayana teacher bless it tho. Oh yeah I can follow. Thanks Pema! And you are right I dunno how to use tools. Excellent info from FPMT, thank you! I plan on filling mine with nembutsu and a copy of the Amitabha Sutra. If anyone knows, FPMT recommends wrapping the “Tree of Life” mantra around the central staff. The homemade prayer wheel from the video doesn't have a central shaft inside the wheel. Would it be sufficient to simply put a roll of that mantra in the center? Regarding the question in your first post, I have two prayer wheels that sound more like what you're trying to make than the Altoids tin type. One sits on a base like this one, for a desk or altar. It spins freely on an approx. 4" long thin metal rod attached to the middle of the base. The rod is inserted into the wheel, which rests on the tip inside. Since the tip is lubricated, that makes me think all you need is a divot or set of washers in the top of the wheel, something like that, to act as a guide. It can be tricky to guide the rod straight in. The second design is for a wall, like this one. I wouldn't try to make this design at home. It seems more complex. There are two short rods: one going into the top of the wheel, and one at the bottom. The bottom rod angles out, then is bent at 45 degrees or so, to become vertical. This allows you to insert the wheel at an angle, then sort of snap it into place so it can spin. It sits on the angle formed by the bent rod, so that's where I put the lubricant. For the lubricant, I use white lithium grease. A little goes a long way, and lasts a very long time. I have a friend who built a few prayer wheels- I got to see how he did the mantras on the metal outside. He took a piece of wood and drew the mantra in an outline first. Then he used a regular power drill to carve the mantra into the wood, so that the mantra is like grooves in the wood. after he had the mantra written out in the wood- he out a metal sheet on top of the wood. He used a small wooden stick and a hammer to then press the letters into the metal. I thought I had some pictures, but can't find them. That's good to know, thank you! So far, I've followed the directions of the FPMT document. It's clear in every detail. I recommend giving it a shot to anyone who is interested. I've been really enjoying this process. I was uncertain on the arrangement of the colors for the Five Buddha Families. Luckily I was able to find an example image online with the colors in horizontal stripes, like =, so that's what I did. I changed the document scale of the Earth and Sky Mantras in Adobe, so it fit the size of my project. It was something like 40% scale. It increased the DPI automatically so the letters remained crisp and clear. The text itself is 4 rows of size 6 font. It ends up being about half an inch tall, leaving spaces between for cutting. I reduced the page margins in Word to fit as many as possible per page. Ended up being 22 sets of 4 rows of 11 mantras. I printed enough to total 2,160 mantras (20 * 108). The finished roll contains the Life Tree Mantra per FPMT, the Amitabha Sutra, then three pages of mantras and dharanis. All told, a paper cutter was a must. I couldn't imagine doing this with scissors. I wrapped the mantras in plastic wrap for protection, then secured it with white tape. I layered five colors of electrical tape on parchment paper then cut it thin enough to fit. I'd also be happy to share the Word documents I made if anybody wants them. Pure Land oriented. I got a garage door roller for the handle, as suggested in the video. I don't know if mine is for industrial use or what, but it feels like solid steel! It's heavy with a lot of resistance to turning. I'll go to a hardware store and see what I can find. Maybe a cheaper one will have looser bearings. Something to be aware of. The top part of the wheel is finished. I found a 10-pack of aluminum cosmetic/spice tins for $10, about 2.5" diameter 1" tall. I glued the Sky Mantra to the top, the Earth Mantra to the bottom, and secured the wheel inside. In order to ensure the HUMs of the Sky and Earth Mantras were aligned once shut, I marked the tin. Vajrapani Phat Hum Bhrum Phat Svaha"
in several passages if the printing pushes back your words and mantras, etc. ?